This is what I wrote during last night’s Parade of Nations. 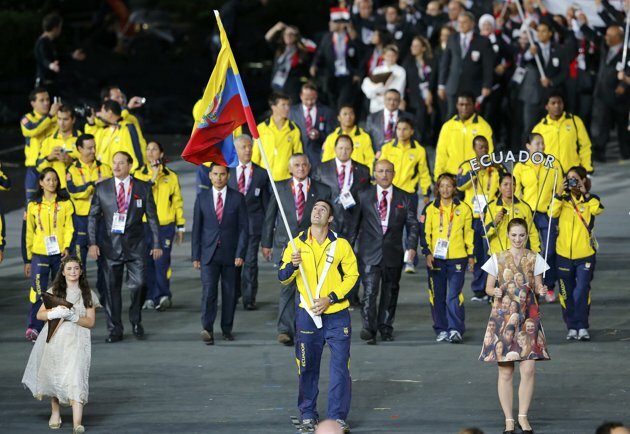 Colombia and possibly some other countries were ignored by the US TV coverage. I paused occasionally but couldn’t pause for long because the DVR only saves 30 minutes of HD programming. I don’t know the names of things and didn’t have time to look them up. Pictures of some of the most interesting outfits are attached at the end. 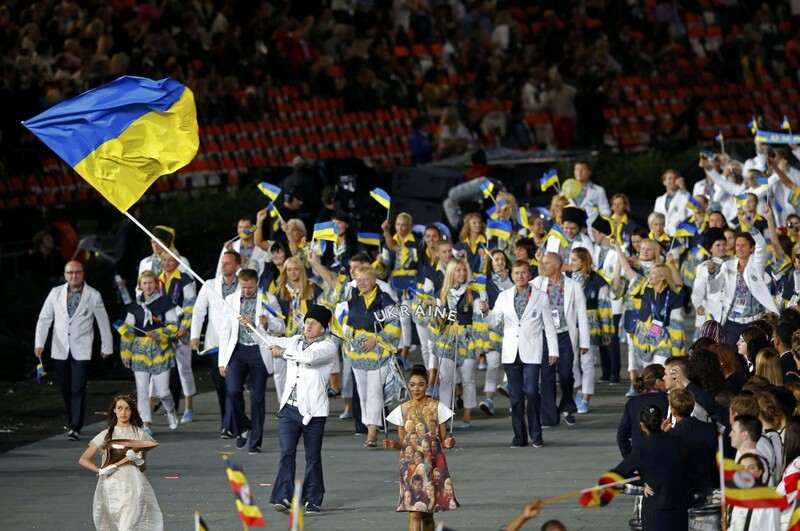 Armenia: look like they’re going to perform a Jewish wedding ceremony or something. Shawls? Linen pants? Australia: hunter green blazers. Women have nice silk neckerchiefs. 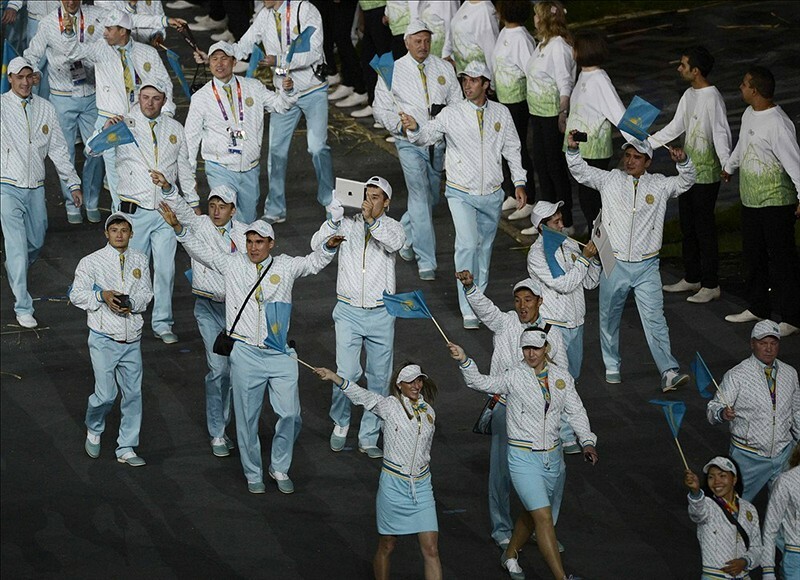 Bahamas: I don’t like the light blue-white combination but it’s their flag colors. More scruffy blazers. Mostly-female team – runners? In 2011 Denisse van Lamoen was voted “Chile’s Athlete of the Year” after winning at the 2011 World Archery Championships. 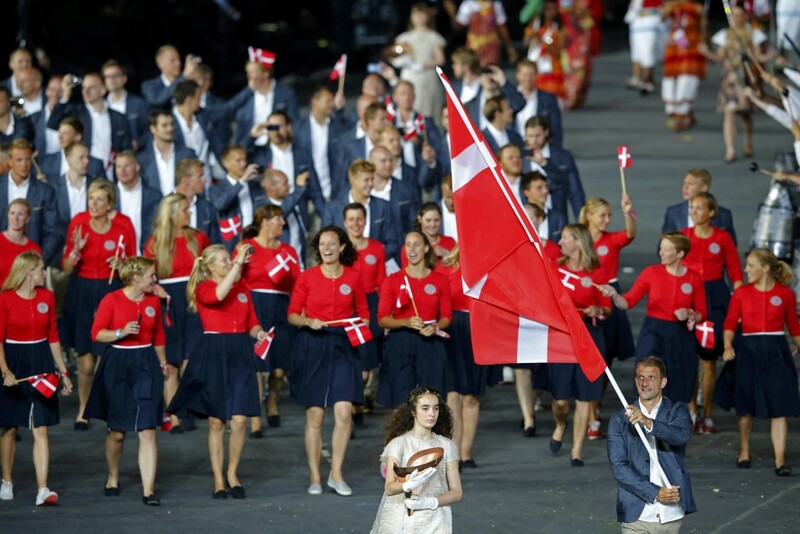 Belgium: Women have red blazers, men have red vests and black suits, look very wealthy, great. B.V.I. tan suits. I like the green scarfs. Brunei: Nice hijab and grey ensemble. Men look generic. Cambodia: Tan blazers, navy pants? You’re backwards. C.A.R. : ties with woolen jackets? Weird. Chile: red and blue striped ties? nothing special. Why don’t they all wear the archery lady’s hat? 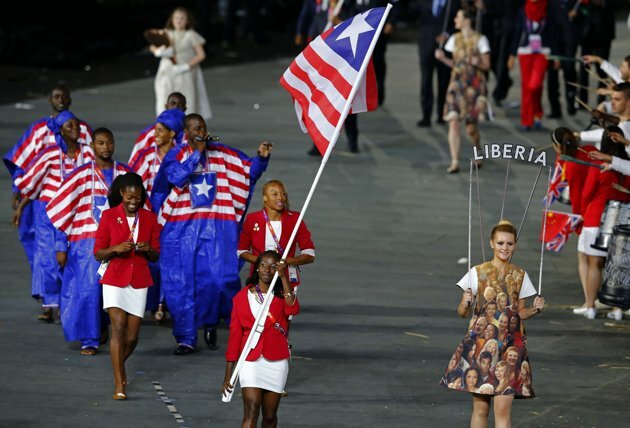 Cote d’Ivoire: These robes are promising. Didn’t see details. 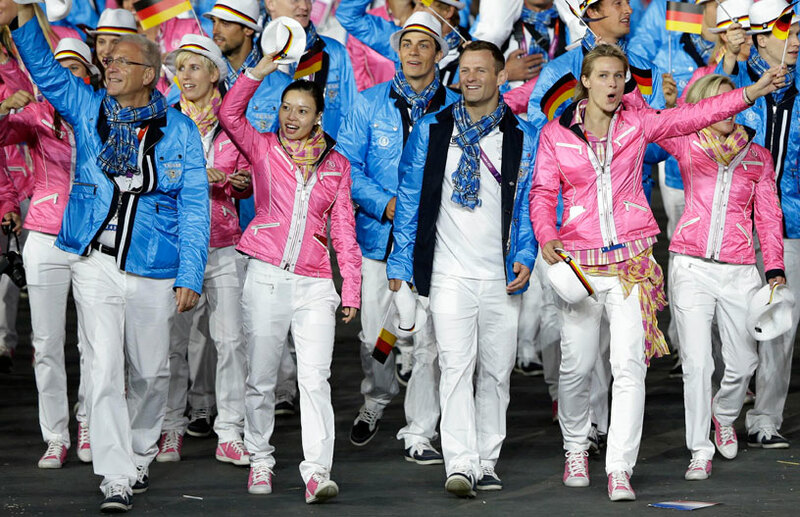 Cyprus: By far the nicest windbreakers so far. Is orange a Cyprus color? Dr. Congo: Yellow polo shirts. First polo shirts of the day. 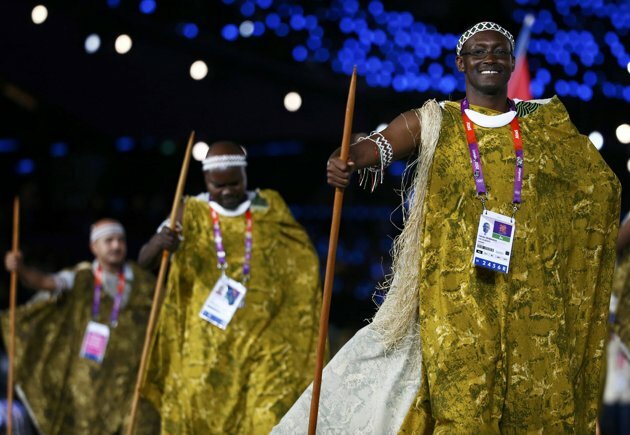 Djibouti – I love the flag bearer. What is this other women have over her eyes? Dom. Republic : Ribbon on cowboy hat exactly lik eBelize. Men in guayaberas with strange stripes. El Salvador: Wow. Gradients from white to navy. Certainly ambiious but … They look a bit embarrassed. Who’s the fat guy? 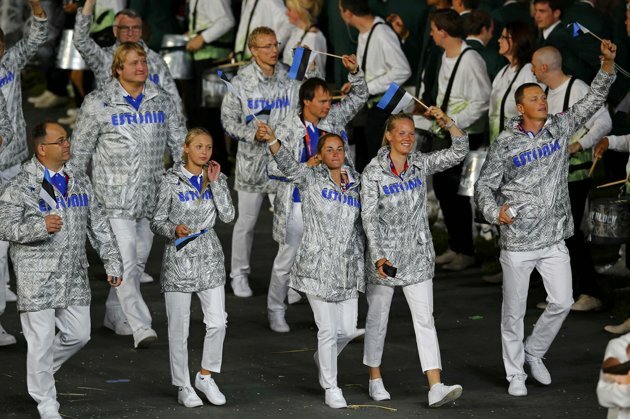 Estonia: those shirts are shiny. How is the name attached? ARE those shirts? France: I guess the ties are the shade of blue on the flag but I was surprised somehow. Not interesting. Designed for looking OK in groups? Guyana: Red shirts, yellow suits. Yellow is the right shade but This is a bit much. Women inverted. 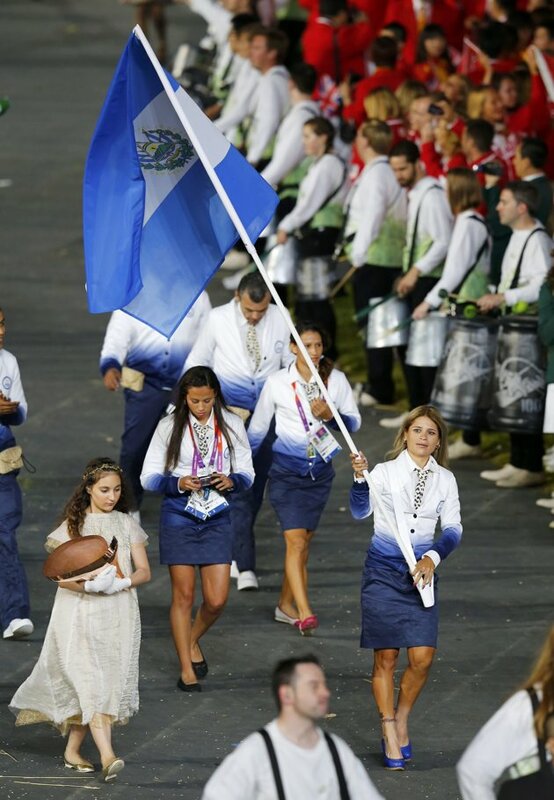 Honduras – look sharp, navy jackets and lighter pants. Nothing between HA and HO? Hungary: Women unflattering red dresses. Men unflattering rodeo waiter outfits. Ireland: that shade of green is always good but the zippered jackets are not. Jordan: women lovely flowers and/or stripes on robes. No men? 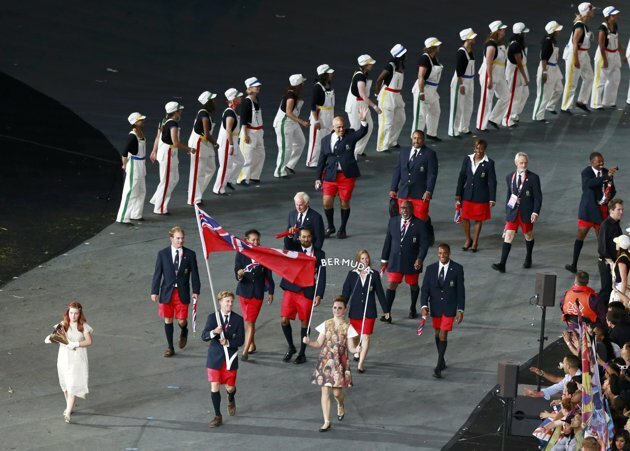 Kiribati – outfit is flag. Nice wreaths. VERY nice wreaths. Laos: Most generic-businessmen yet. Few even wearing techy glasses. Latvia: Can’t go wrong with those colors. Well you can, but they used cream instead of pure white. Levanon: Red is too orangey. Men and women have NOTHINg in common. Libya: One guy in a nice suit. Lithuania – birght shirts, big collars, white jackets. Doesn’t quite work. Kevin Kline looks proud to be there. 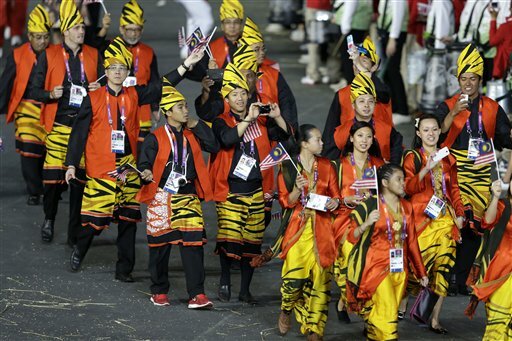 Malaysia – Oh god. Tiger-striped hammer pants? Red and white sneakers? Tiger-striped papal miters? 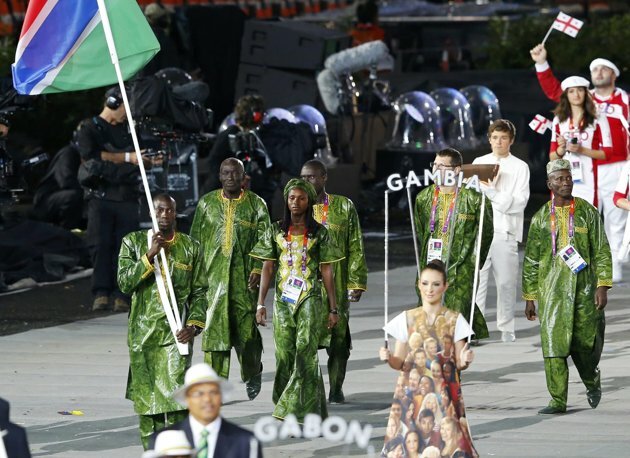 Mauritania – rival Mali in nice robes, this time blue. 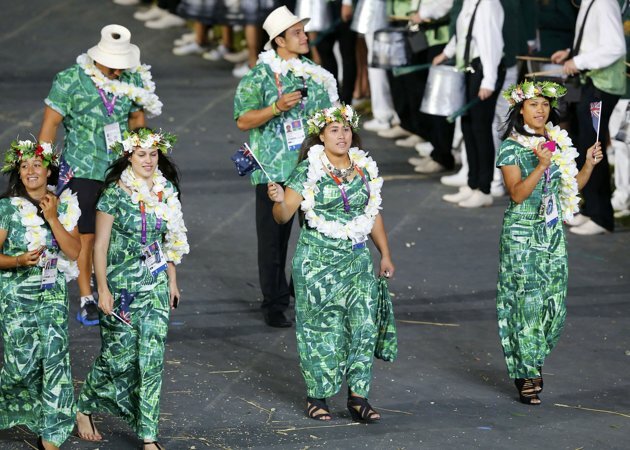 Micronesia – tropical shirts but don’t look stupid. Montenegro – HOW ARE THIS MANY? Montegro like 400,000 people, 4,000 are Olympianms. Handball and water polo teams? Look like suede suits. Many buttoned only top button of 3 and look sleepy. Mozambique – I like these shirts – burgundy. Black pants. Tan jackets. Nice actually. Myanmar – nice grey suits. Nepal – women in fake-looking dresses. Men in cool black hats. 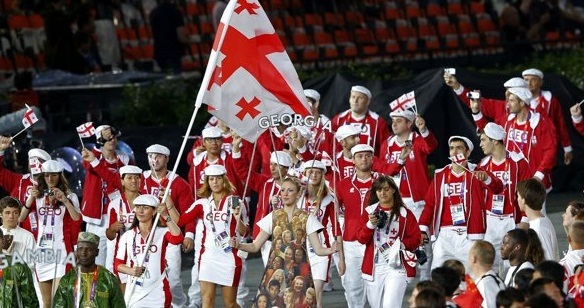 Netherlands – Michael Phelps carries the flag. Again these people have too many outfits. Orange is limited but still too much. Palau – these look like corduroys. 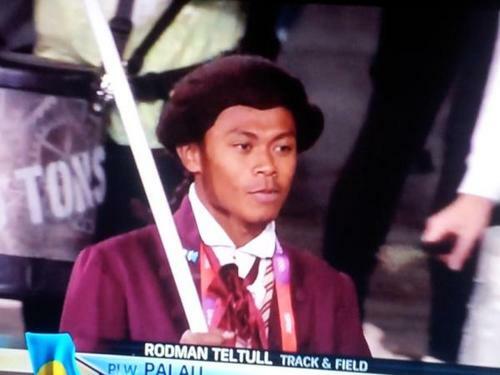 Flag bearer is wearing Patrick Henry-style wig. St. Lucia – black sneakers? 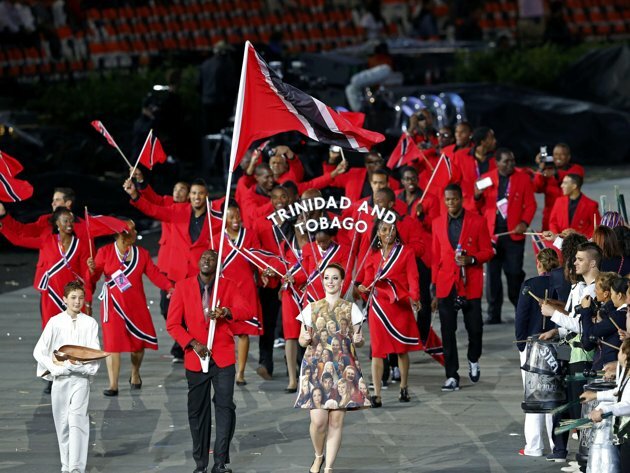 St. Vincent and Grenadines – same ugly green pants as Jamaica. Tops are unique and go well with flag . Samoa – flowers in hair. Sierra Leone – not robes! Flowing white crinkly shirts, nice green yokes. 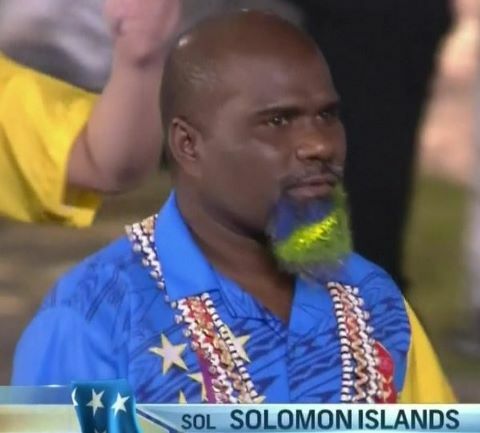 Solomon Islands – they look embarrassed by those getups. What’s that guy done to his beard? Somalia – Sky blue looks good for hijabs. Men’s scarves with stars look chintzy. South Africa – Colors all over the place. Would look good on one person, not a crowd. 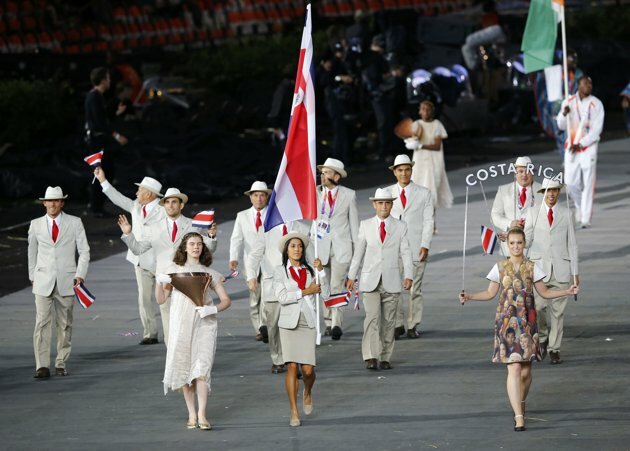 Thailand – understated and attractive suits. Women in same suits as men but without ties. 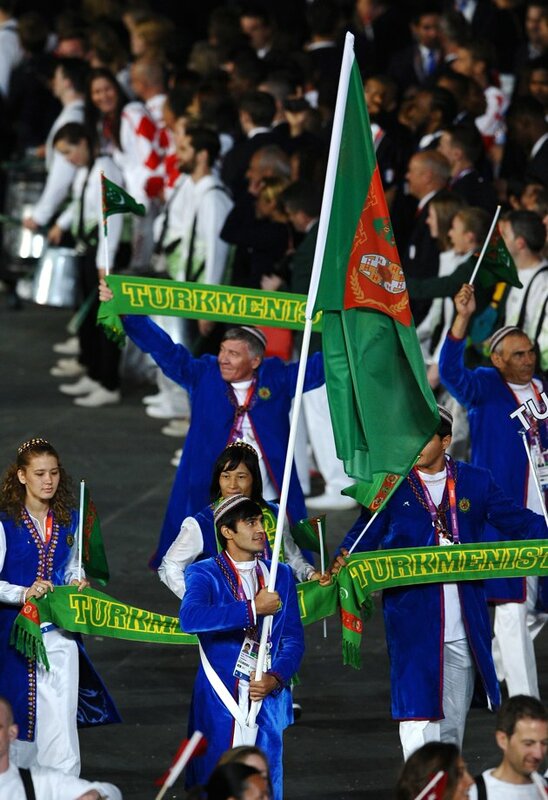 Timor-leste – again nice flag scarves. Not much else. 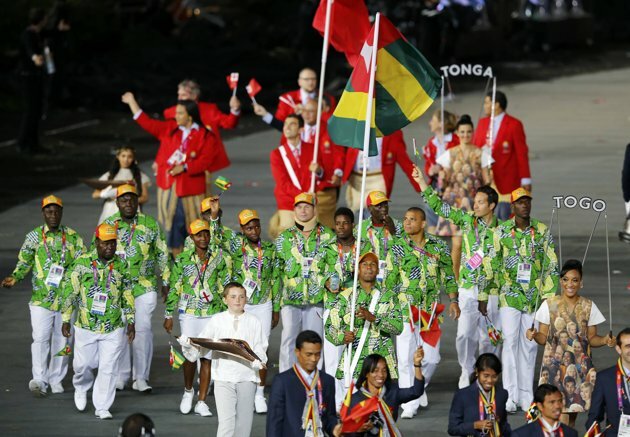 Tonga- – Plaid-ish ties are good. Everyone has a DIFFERENT grass-skirt thing. Ties are very good. Turkmenistan – WOW. Velvet jackets. Satin? I forget which is which. Great hats but just for women!8-pointed stars! Blue! Green! Tuvalu – face paint. Dumb tracksuits. Unique color scheme, blue and orange but not bright. Uganda – men have off-white shirt things with great collars. Women have matronly robes. Venezuela – all white. Never good. Vietnam – cream jackets, dark tan pants. Snappy. Virgin Islands – US ones? Most rustic straw hats yet. Nice blue summer shirts. Yemen – that guy looks really wealthy. Jackets too shiny for black jackets. 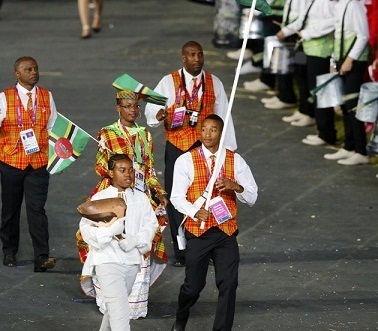 Zambia – hunter green jackets, light green ties. I guess I always like that. There are not many photos out there of the costumes. I couldn’t find Madagascar or Malawi or Niger, some of the best African ones.